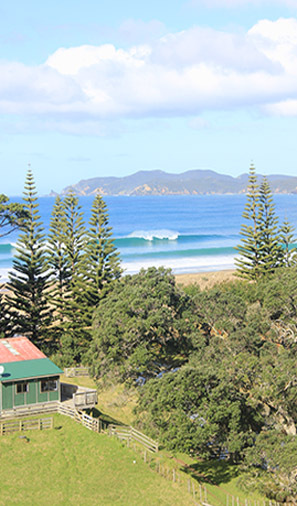 The Shearers Quarters is located on the North Eastern Coast of Great Barrier Island and sits on the beautiful Whangapoua Beach. It is very quiet and tranquil for the perfect adventure or relaxing holiday escape! There are thousands of metres of rocky coastline to explore and discover so bring your snorkelling gear and fishing lines! Located in the Shearers Quarters are books & brochures on walking tracks, and local history, infact tucked in the corner of Whangapoua beach are the graves of the many that lost their lives aboard the Wairarapa when it shipwrecked back in 1893. We will also provide you with information on where to dine out, art galleries & museums to visit, golf, fishing charters operators, hot thermal springs & other walking tracks and other helpful tips.